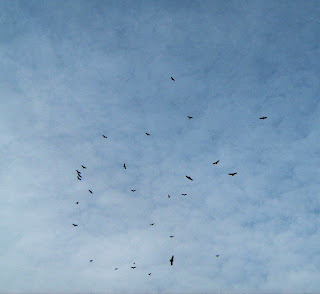 The other day I walked outside and saw about 50 Buzzards swarming my house. These were just a few of them. They were doing circle after circle around my driveway. It's amazing how they don't really have to flap their wings too often. They just seem to glide in their circles. I wonder if they were mistaken when they saw this? No, they are not dead, but sleeping. I would like to take the time to point out the larger dog on the left, that is Brodi. Look how fat he is getting. He hardly fits in the bean bag! Any way, back to the buzzards. They could have mistaken this one. Nope, not dead either. Little Cowpoke is just sleeping. 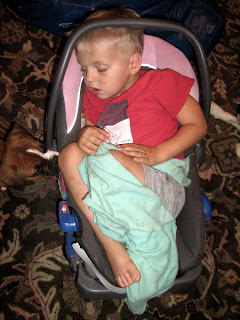 Poor middle child, squeezing himself into the baby car seat. What shall I do with him? I think the entire reason the Buzzards were flying around my driveway is because they saw this. She really looks dead. How can that be comfortable? 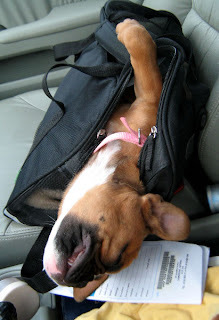 I am not even sure that is how the dog is supposed to lay in the car carrier. I might be mistaken, but it's just not right. She is the strangest puppy. When she plays, she plays hard. And when she sleeps, she sleeps hard. Oh, how I can't wait for her to be two years old. 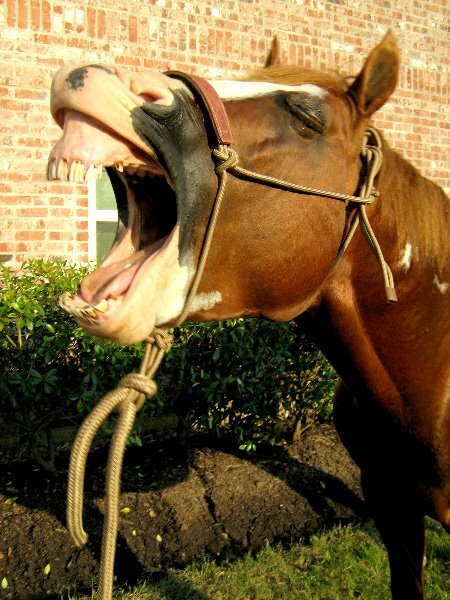 I can do with out the teething stage. Are you heading over to Jennifer's shower on Sat? I think I'm gonna go, and are you bringing the girl? I love the sleeping photos. Especially little cowpoke in the baby carrier. Perhaps he wants to be your little baby again! What a cute post. I always say, "Oh oh" whenever I see birds circling, and then I check on all my animals to make sure they are alive. I'm going to look for a picture of my Corgi lying on her back and post it just for you. It is the cutest thing. I can never resist rubbing that belly. lol! The buzzards circling and all of those sleeping (oddly) creatures at your place. lol! And you must be going nuts with all that cuteness at your house. Do you just walk around all day saying "Awwwwww!" lol! 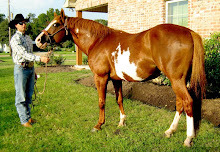 By the way, I forgot that Ozzie was a paint, or that you've got some paint babies due this Spring. Yes! So you do qualify for a Paint Approved sticker! Come on over to pick up your little goodie, my friend. If you need instructions to upload it, just let me know. 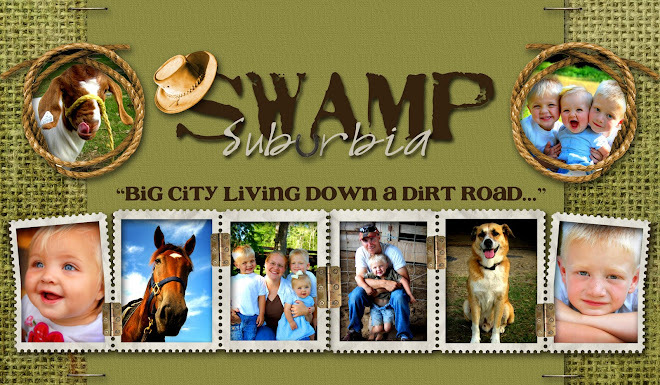 Buzzards are the last thing we ever want to see around our cattle pastures. 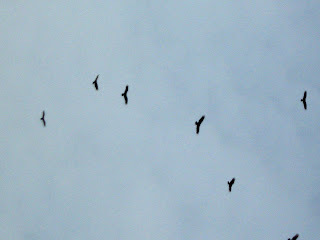 When I see them circling, I begin to get knots in my stomach... never a welcomed site. As I have mentioned before...your kidlets are too cute!! Why is that everyone else's kids are "cute" and mine are just monsters??? LOL!!! AWWWWWWWWWW how sweet! Not the buzzards of course! I never like to see them, normally not a good sign! We have been having alot of black birds around, weird I tell ya! 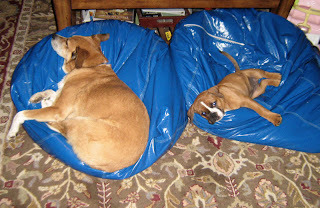 Love the bean bag dogs! I would have to go see my chircopractor after I slept like she was in the last pic! LOL! Good grief, I don't think I've ever seen so many all in the same place! The most I've seen up here at one time is maybe 5. Yikes! BTW, you've received an award, come pick it up! did he just crawl in that carrier for a nap? playing hard and got tired? he is so dang sweet!